I know I mention it almost every post, but our house is on the market. And it's slowly driving me insane. We're only on two weeks, but since we put a contingency offer in on the place of our dreams (in the rough!) -- we're getting our game faces on. 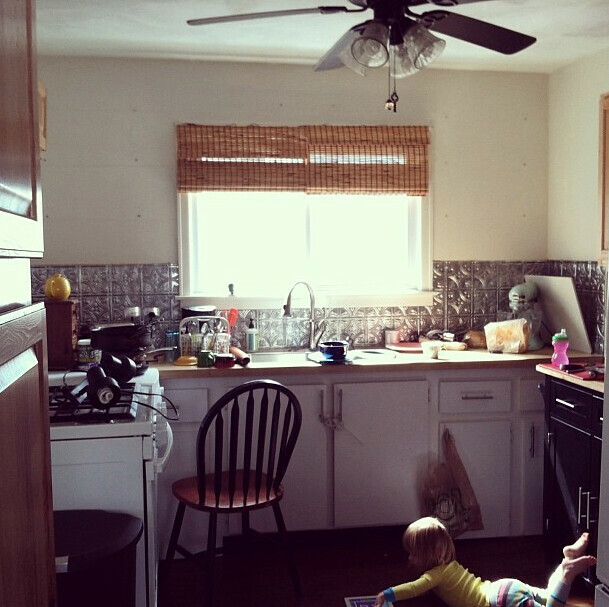 We've had 7 showings so far, and at least three of those potential buyers have had a beef with our kitchen. Here's what it look(ed) like. 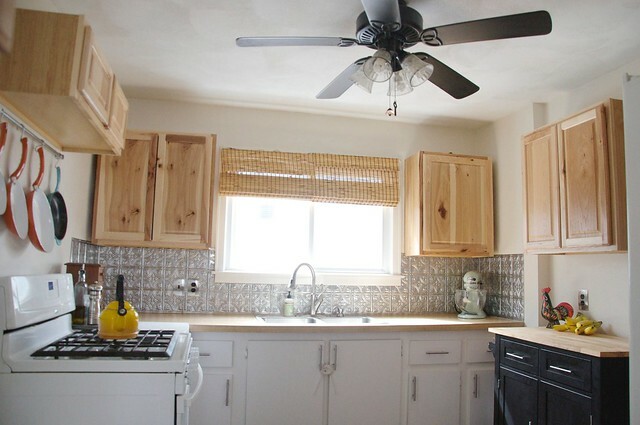 I admit that when we were getting stuff together for our listing, I sort of neglected staging the kitchen simply because the rest of the house took so much work. 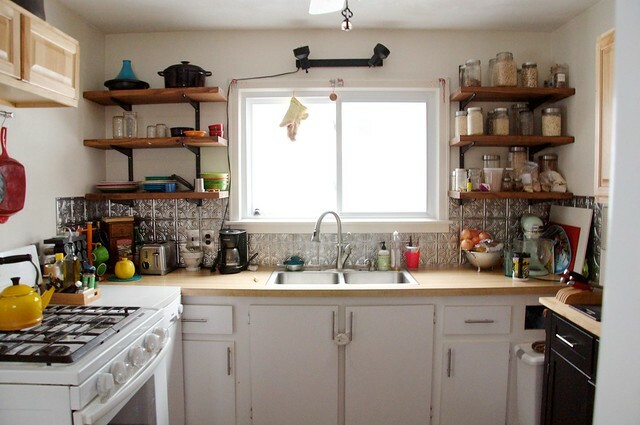 The kitchen was clean and still very functional in the way that I use it (heavily) every single day. 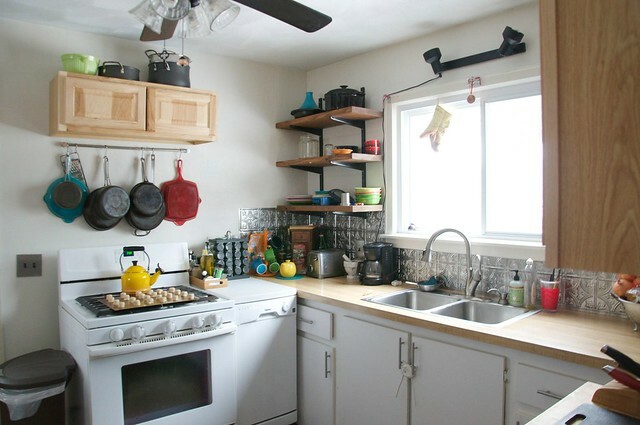 We loved putting in the open shelving a couple years ago, but definitely knew it was going to be a love or hate thing once it was on the market. So, I did a little crowdsourcing with my friends on Facebook and got TONS of helpful opinions on ways to spiff up our space to make it more friendly to potential buyers. Stuff like "clear off those counters!" and "paint the cabinets white!" 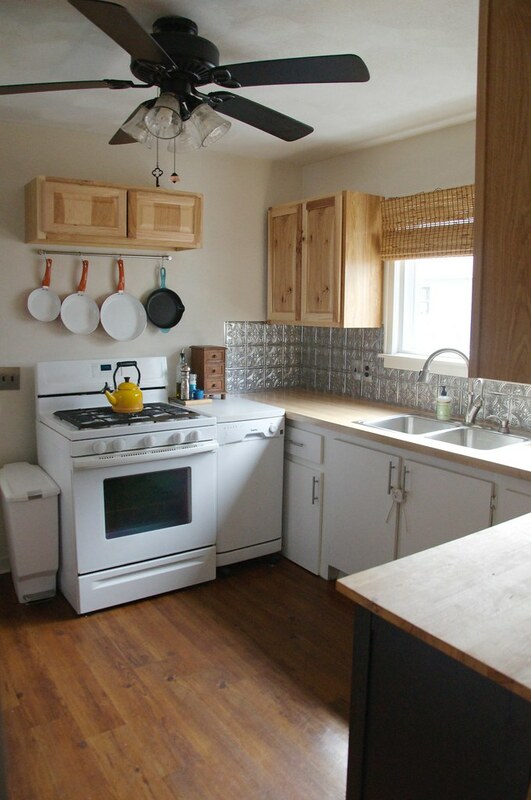 or "add cabinets" (which is also what our realtor suggested) and "take down that awful light above the sink!" It all made sense. But with budget on my mind, I cautiously got to work. And by "I" I really mean me, myself, and I. Didn't quite get a chance to tell Stephen when I was up to, so I got a very confused call from him in the middle of the day (in response to the following photo) when I was out with my dad picking up the cabinets. I think my aggressive decision-making paid off. After considering a variety of options, I ended up going with what I felt we could handle in a day's time. I got two new hickory cabinets for either side of the window and a can of white paint to brush over the black chalkboard wall. I cleared off as much clutter as humanly possible. I got a cheap set of new, clean pans to hang over the oven, and hung some blinds over the window (they were in our basement). I think it looks a lot better for just 24 hours. In all, the cabinets and other supplies cost around $400, so we're really hoping it helps attract some buyers in the next month (or sooner!). Time will tell, and we know there are still some major issues, like the blockage of the bottom cabinet space to fit in the dishwasher. Honestly, our house is positioned and priced as a starter home, so I'm having trouble doing much more than what we did yesterday. 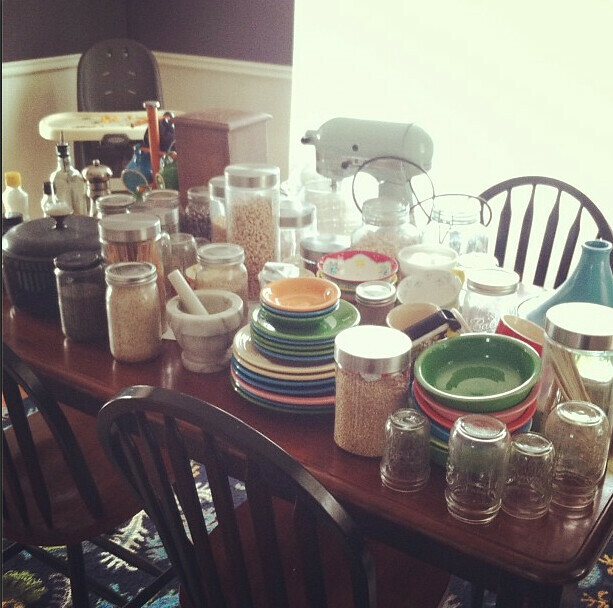 I mean, when we moved in, the kitchen was carpeted. 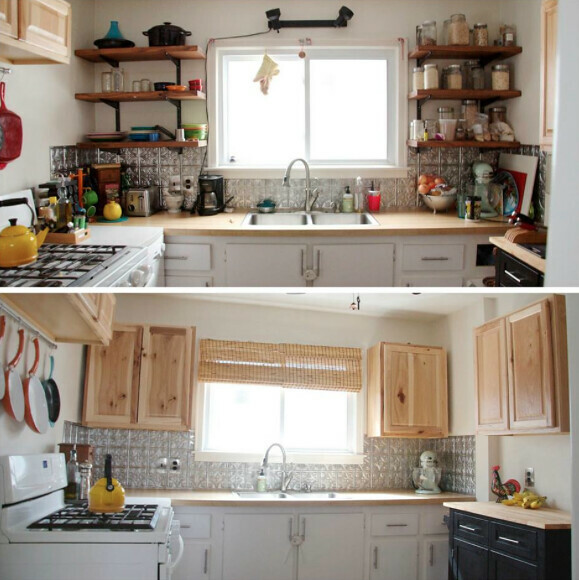 It lacked ALL the cabinets that are hickory in these photos. 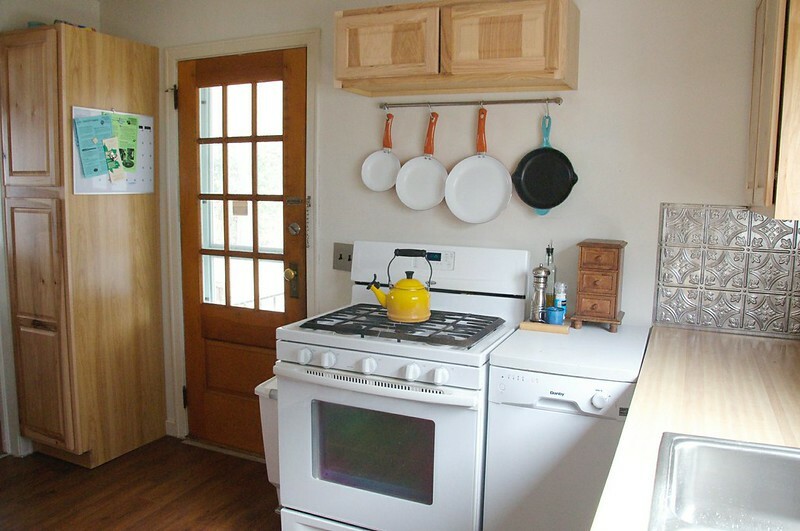 It had old appliances and zero dishwasher -- plus the refrigerator was jutting out into the space. We're not asking much more than our purchase price, so I'm just hoping to get some level-headed people without a huge "MUST-HAVE" list. I've obviously done well cooking in this space, and I think it's pretty good for a starter kitchen! I think it's a dramatic difference for it being so quick. I just hope all the work was worth it! It's definitely come a long way since our first attempt to refresh the space. There's another "phase" of the project, though, if our realtor thinks it's a good idea. I'd switch out the ceiling fan and kitchen island for WHITE to match the rest. It was an overwhelming request of my friends -- and I purchased an inexpensive fan. I just can't find a kitchen cart of island locally that's the right size in the price I'm willing to spend. We'll see. Do you think the kitchen makes the cook or the cook makes the kitchen? I'm in the camp of not needing tons of space or fancy whatevers to make most of my meals. And my life, for that matter. Plus, in the place we're looking to move next, the kitchen is WAY behind this one. Maybe we're just weird, but I can always look beyond a home's flaws to find its true beauty. Fingers crossed we'll find some creative buyers with a little imagination. Also: If your house is on the market or will be soon, ask your friends what they think. I'm so grateful to mine for all their help!